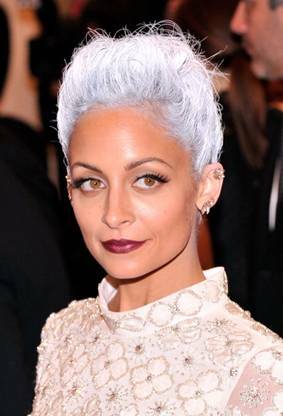 When Nicole Richie arrived on the red carpet at the Met Gala, photographers went crazy as they realized Nicole had colored her hair grey for the occasion, a spot on representation of the “Punk: Chaos to Couture” theme of the evening. Nicole’s stunning burgundy lip and beyond long lashes completed her look, and we caught up with makeup artist Beau Nelson of The Wall Group to get the details on Nicole’s makeup for the Met Gala. “Nicole’s dress was not an obvious punk choice but her nails definitely were, and were the starting point for the inspiration of her makeup. Once I saw the color of them all I could think about was doing a velvety matte dark lip,” Beau tells us. He started Nicole’s look by using Giorgio Armani Designer Lift in shades 8 and 6 to create dimension on the face and then using MAC Contouring Creme to bring out her cheekbones and jaw line. Then, Beau applied Maybelline Age Rewind Concealer under the eyes to brighten, setting the makeup with Shu Uemura Colorless Loose Powder on the face and Laura Mercier Brightening Powder under the eyes. On Nicole’s eyes, Beau used Shu Uemura and Bobbi Brown shadows to sculpt and enhance her natural eye shape, then Laura Mercier Liquid Eyeliner Pen at the base of the lashes. For the mega lashes, Beau used real mink lashes from Velour along with L’Oreal Carbon Black Mascara on curled eyelashes, and finished the eyebrows with Tom Ford Brow Sculptor in Espresso. Beau mixed a special color for Nicole’s lips, combining Chanel Rouge Allure in Rouge Noir and MAC Lipmix in Black and Fuchsia and applied with a lip brush for precision. He finished Nicole’s look with Tom Ford Citrine illuminating the top of the cheekbones and the brow bone to give her skin radiance.